This is my one hundredth post on this blog. When I think back on the way I started out, I can’t believe what a journey it has been. I was a different person a little over three years ago, and for all the things that I was lucky enough to experience and write about since then, I am nothing but grateful. There is not a day that passes when I don’t think about one or the other experience that I have made travelling and that has shaped who I am today, and not a day that passes without saying a silent quick prayer of thanks for that. The One Hundredth deserves to be celebrated with a truly special place, and what else could that be than a bridge. Next to Mostar’s Stari Most, this is the Bridge of Bridges to me: Mehmed Paša Sokolović Bridge in Višegrad, Bosnia & Hercegovina. And what else could have inspired me to desperately want to see this beautiful and powerful piece of architecture, this work of art in itself, than literature. I mention Ivo Andrić’s monumental book Na Drini ćuprija (The Bridge on the Drina) in My Mission statement. It is a nobel prize winning novel about the small town of Višegrad, about its inhabitants and its culture, and the bridge around which the town revolves – from its construction in the 16th century to its destruction during World War I. The book encompasses four centuries of joy and pain, laughter, tears and blood. It is a collection of anecdotes and a compendium of beautifully drawn characters, a lesson in history as much as a lesson in humanity. No one who loves the book could possibly finish reading and not want to see the bridge. I was so lucky as to come to Višegrad on a beautiful day in May three years ago, on a quiet and sunny day at that, and I sat down on the bridge an finished reading the book about the bridge. Words cannot express the elation I felt in that moment. Different parts of my world were coming together. Everything made sense. Surely it is my analytical mind that looks back on that day and notices how perfect it was more so than my actual self back then, but I do remember being completely and unconditionally happy in that moment when I sat on the Kapia and read the book. The kapia is the little balcony that you can see in the middle of the bridge, across from the stele you see rising up. Central stele – the inscriptions are in Turkish, but they are mentioned in Ivo Andric’s novel and according to that, they tell of the construction history and ask God for his blessing of the bridge. I only passed through Višegrad, I never spent the night. It is a small place that except for the bridge has not got a whole lot of amazing sights to offer. So I had my pack on me as I sat on the bridge. Walking by were two German soldiers I chatted up. They were stationed in Foča, if I remember correctly, and told me a bit about the international military supervision Bosnia & Hercegovina is still under after the wars of the 1990s. It felt weird to speak about this when all around me and inside of me there was this great sense of peace. I have another favorite book that is set there by an author who is not much older than me. He is called Saša Stanišić and the novel „How the Soldier Repairs the Gramophone“. It is set in the 1990s and deals with the Balkan wars. I only read it after my trip down there, but I would like to go back to Višegrad having this second literary perspective on the town. It is, after all the sight of the Višegrad massacre in 1992 that included Bosniaks being murdered by Serb troops on the very bridge you see in these pictures. Now of course there is no talk of that in the novel by Andrić, which was published in 1945. History is yet more multi-layered than can be covered by the four centuries Andrić describes. Through all the history and all that can be learned from being in a place like the monumental Mehmed Paša Sokolović Bridge, however, what sticks with me more than anything else is the beauty of the ancient construction, the coolness of the stone, the color of the Drina river and the peace and quiet that filled my heart and soul on that beautiful day in May 2010. This post is based on this German original / Dieser Post basiert auf diesem deutschen Original. While I figured fairly early in my big Balkans trip three years ago that I probably would not get to see all the countries I had originally thought about, I also knew that there were certain countries that I would most definitely not skip. Mainly those that my mum would have felt better if I’d skipped them. „Honey, you sure you need to go to Albania and Kosovo, all by yourself?“ Hell yeah. I’m not going to go to Serbia and not also go to Kosovo! There was a story there with those two countries, and one I had not the slightes understanding of, and I was not about to let that be the case for much longer. So I did go to Kosovo. And the country surprised me in all the right ways. I went into Kosovo from Skopje in Macedonia. If you enter into Kosovo from Albania, Macedonia or Montenegro, you won’t be able to leave the country straight to Serbia, and if you enter it from Serbia, you won’t be able to leave straight to Albania, Macedonia or Montenegro. Getting into Kosovo from Skopje was certainly the easiest route in my time, if only for the direct bus connection between Skopje and Prishtina, but that may have changed and other options may be available. So why is it so complicated again? Kosovo declared independence from Serbia in 2008, after there had been war there from 1998 through 1999, followed by a long UN administration period. I won’t go into detail because I don’t know much about it myself, but as is custom in the area (note the irony! ), it was mainly a conflict of ethnicity, religion and possession. Serbians see Kosovo as an area of their cultural heritage, with beautiful Serbian orthodox monasteries and the site of the Battle of Kosovo – a founding myth of modern day Serbia, if you will. It took place in 1389 between the Ottoman Empire and the Serbians and delayed the Ottomans taking over the area for a little while. Today, however, Kosovo is mostly populated by Albanians who are Muslim. And that is where the problems start. Serbia does not recognize Kosovo’s independence, so if you enter Kosovo from, say, Macedonia, through Serbian eyes you have entered Serbia already, but don’t have an entrance stamp which is why you cannot cross the boarder from Kosovo to Serbia. And if you enter Kosovo from Serbia, in Serbian eyes you have never left the country. Going to Kosovo was, considering all of this, not at all a big deal. The boarder police asked me if I was coming on holiday, and bid me good day. I never even got a stamp, which I chose not to mind because I wanted to return to Serbia at one point and knew that a Kosovo stamp might give me trouble. I am still a bit sad though that I have no sign of having been there in my passport. Prishtina was grey and ugly, and the traffic was pure craziness – but downtown there was a pedestrian zone where the atmosphere was that of an on-going fair. Hideous plastic toys of all provenance where sold, and I immediatly felt the information to be proven that the average age in the country was 25. There were no old people – not even older people, it seemed to me. But there where children – everywhere! They ran and played and screamed with the joy of life, and they made me smile with the realization that beauty exists even in a grey, dull pedestrian zone with ugly plastic toys and socialist concrete buildings. And sitting or working in coffee places, the Kosovar people laughed just like the children of their country – open, untainted, honest. Peja reminded me of Ulcinj in Montenegro and Novi Pazar in Serbia – formerly Yugoslav cities with a big Muslim minority and influence. I had a cappucino in a street cafe. It was pouring rain. Just outside the terrace that I was sitting on, there was a fountain. The waiter put the coffee on my table, had a water glass in his hand, went over to the fountain to fill it, and put it on my table where it was dripping water on the notebook I was scribbling my impressions into. The waiter gave me a big smile with this. Then electricity stopped going. I had heard the generator all the while. Kosovo runs on two power plants, and one had gone broke that morning, so half the country was on generators, and a bit overstrained with it, I take it. No one seemed to mind, though – and that fact calmed me with quiet joy. Prizren, which I have written about already, was certainly the prettiest town there. I had met an American guy on the bus and we went to see the Serbian Orthodox church up the mountain. Meters of barbed wire and KFOR protection. We were not allowed to enter even the premises. Back down in the town, we passed the Catholic church, and two teenagers that saw us asked us right away if we wanted to go in, and fetched the priest. He spoke German very well and I translated to English for my American friend. „We don’t need military protection down here,“ he said, „but in my opinion the Serbian churches don’t need it either.“ In the yard, yellow and orange roses were in full bloom. There was peace. Every coffee house had me meet someone who I had a quick chat with. I got asked on dates and invited to house parties in Kosovo, had delicious Albanian food and bought an English book in a great little international book shop. War? Please, that was more than ten years ago!! Still there were the occasional reminders. Bombed out Serbian houses. A long fence showing pictures of missing relatives. And the big statue of Bill Clinton in a suit with a briefcase, waving fatherly – I almost broke into loud laughter at the sight of it because it seemed ridiculous, but it is a serious matter for Kosovar people. The States have supported the country massively in its fight for independence. I had asked couchsurfing hosts in Serbia what the big deal was with Kosovo – a naive question that might have gotten me in trouble in the wrong company, but quite usually the answer to me was simply: „What would you say if a part of your country decided to break away and be independent?“ I didn’t say it, but thought: „Well, some Bavarians would like to do that, and to be quite honest, whatever, you know, let them do it, only the German economy would break down and not be able to handle it I guess.“ Kosovo is not economically relevant to Serbia though. So I still didn’t quite know what to do with that argument. I understood, though, that it was really mainly, if not purely, cultural. One impression was particularly overwhelming in Kosovo: This was not Serbia. It was not Albania, either. It was Kosovo. I am curating a twitter account this week that works by the rotation curation principle. It is called @i_amgermany and a different German or lover of Germany tweets on it every week, changing Sunday nights. Of course that makes me want to write about Germany on here this week, but I don’t exactly have a post in the drawer, and to be honest, taking care of two twitter accounts takes a lot of time. So truthfully, it is a bit out of lack of time that I am bringing you a photo essay this week. Then again, when I look at the beauty I have to offer in this, I don’t think you will take it too badly. I am trying to show you the variety of what my beautiful home country has to offer, and I hope you will enjoy it as much as I did picking the photos for you. Of course there are the thriving cities of Germany – Berlin, the largest and the capitol, surely comes first and foremost, but next in size are Hamburg, Munich and Cologne, and they are not to be neglected. All of them are very different, yet charming in their own ways. When in Munich, climb up Alter Peter’s church tower – the view will be worth it!! But there is also landscapes! I had to cut down to a very small introduction of what Germany has to offer in that department. There’s the North and Baltic Seas in the North, and the Alps in the South, and a whole lot of rivers, mountain ranges, forests, lakes and fields in between. And in general there is much architecture to admire. Be it sacral in churches and monasteries or functional in post offices, train stations, hospitals, universities and so many more. Germany is just really pretty. Nothing to argue about that! Lübeck with its hanseatic beauty of red brick stone holds a very special place in my heart! Would you mind going to school here? This is Greifswald university, right by the Baltic Sea in the North East of the country. I absolutely loved my years as an undergrad student here. Sometimes the beauty is not taken such great care of. This former hospital complex in Hohenlychen in Brandenburg is slowly left to decay. Such a shame. Tübingen, another university town, has charmed everyone I know of. Studying there for my Master’s wasn’t the worst thing that could have happened to me. I could have and would have wanted to show you so much more, but I had to stick with places I had decent footage of this time around. Time and time again I think that travel in Germany alone could take years and years. What are your favorite places in Germany? Or your dream destinations? Any places you think are must-sees – or need to be avoided? It was a big deal when I turned 12 years old for two reasons. One: I was allowed to sit in the front of the car now. Not that I got to do it very often as long as my older sisters were around to steal that much desired seat from me at every option. But it did make me feel very grown up when on my 12th birthday I was sitting next to my dad in the front seat of our family car. Two: My dad had made it a rule to take each of us girls on a small trip to a destination of our choice for their 12th birthday, just he and the respective daughter. My oldest sister chose to go to Berlin with him. My middle sister went skiing. And I went with my dad to Cologne. I do not remember why I chose that city, but I have beautiful memories of it. So when last week I was due to go to a meeting in Düsseldorf, I decided to stop by Cologne for a few hours – just to check if everything was still there, you know. When I got of the train at the main station, I was a bit taken aback by the cold. I had spent the last few days in Southern Germany where Spring had made its first careful appearance, and the icy wind in Cologne came as a bit of a shock. But the sun was shining, and upon leaving the station, the immediate view of the Cathedral erased any doubts as to whether this had been a good idea. It was majestic and elegant, humungous yet delicate. Once more I stood in awe of this magnificent building. I didn’t enter right away though, since I had absolutely no money on me, not even a coin to lock in my luggage at the train station, so the first thing I did was stroll into town in search of an ATM which proved rather difficult to be found. But who was I to feel annoyed by that. I was in Cologne, I had time on my hands, and walking through the city was fun even with pulling a carry-on the entire time. Although I only meandered through what seemed to be the shopping district of Cologne, I found the city to be very atmospheric right away. People around me were talking in their funny, jovial Rhineland dialect and I kept listening in on conversations because I love the sound of it. But what made this afternoon most perfect, inspite of the freezing temparatures that sent me on to Düsseldorf with a cold, was the many many street musicians in the pedestrian zone I was walking through. I had to think of Istanbul where I first had the sensation of changing spheres every few meters with a new street musician adding to the moment’s glory. I recorded a few examples for you. There was a guy with a flute and a few small jingle rings attached to his shoe that he was pounding with rhytmically so that his playing looked like a dance. And one with steel drums right in front of the cathedral that was a lot calmer, and his tune sounded funny in its solemn gravity. My favorite by far was a Klezmer Trio. Klezmer is a music style very dear to my heart which surely is rooted in my affinity to Eastern Europe. There is so much craving and longing, so much ambition in it. I feel that Klezmer is always driving onward, striving for more, urgently pressing to the next note, the next melody. And when it gets there, it is sighing in relief, only to move on right away. It speaks to me because I find myself as a driven spirit in its melodies and rhythms. After having enjoyed these musical encounters in the pedestrian zone of Cologne’s downtown and having finally found an ATM, I made my way back to the cathedral. The square in front of it was lively and packed with people. I approached the front gates with their characteristically gothic arches, and as I came closer, I looked up toward the towers reaching for the skies, as though they were actually trying to connect this earthly world to its creator. I finally got up to move over to the candle stands. I really love the tradition of lighting a candle for someone. When I was still in school, my mother always used to light a candle at home when I had an exam, all the way through my final exam in grad school. She sat it on our dining table and every time she walked by it she would think of me and cross fingers. I have lit candles in many many churches. To me it is a beautiful manifestation of my thinking and caring about someone. Looking at the stands filled with flickering lights, I was wondering who they had been lit for. I was wondering how many candles had been lit by people for themselves and how many had been lit for someone else. I though that there was maybe a lot of desperation and anxiety behind this – candles lit for people who were ill or had lost perspective and focus. So I thought about people dear to me and lit two candles out of the pure joy of living and experiencing beauty. Lights of gratefulness to shine and impart hope. And I hope amongst the candles were others like mine. Dieser Post basiert auf diesem deutschen Originalpost. My first visit to Poland was when I was 8. The second visit of this place that I would come to love so truly didn’t happen until 13 years later. I had been learning Polish for two years and was excited and curious for this country that I had but a dim and distant memory of. After all, I had decided to make it part of my life by studying its language, culture and, above all, its literature. I signed up for a four week language course in Kraków. Back then, one rather chilly day in early March, I got off the bus from the airport at the main station just by the Planty, a green belt, a little park that encircles the old town. Looking up to a grey sky and breathing in Polish air for the first time as an adult, I was full of anticipation and a giddy nervousness, as though I was going on a first date. The church towers led the way, and I walked towards them in the direction I supposed the old town’s center to be in. I walked down Floriańska Street towards the Rynek, the main square. I didn’t know that Floriańska was a famous street. I didn’t know it led to the Rynek. My legs carried me on as if they knew they way, as if they’d walked it a hundred times. A feeling, nay, a certainty came over me that I had been here before. There was music everywhere. Pictures flashed in front of my inner eye, pictures of heavy red velvet curtains that I would see at Cafe Singer in the Jewish quarter Kazimierz later during my stay. My soul seemed to recognize the city from a former life. Until today I feel sure that this first visit to Kraków wasn’t actually the first. Instead, I was coming home in many strange, yet very natural and sensible ways. When people ask me today why I love Kraków, this experience is really the only answer I have for them. To be quite honest I don’t understand the question. Kraków was the first city I ever really fell in love with. I have been there many times since, and every visit just makes my love for it grow. Sitting bei Wisła (Vistula) River, just below Wawel, which is the castle hill. A sunny day in early April. The river is making a large bend here, and it runs calmly and proudly as though it couldn’t ever run wild and burst its banks. In this moment I realize that I have never felt like a stranger in this city. Or having my first Zapiekanka at Plac Nowy (New Square) in Kazimierz. Zapiekanka is the Polish version of fast food: a baguette, essentially with mushrooms and cheese, grilled in the oven and topped with lots of ketchup and chives. Yum! And there’s no place in all of Poland where they are better than at the Okrąglak, the funny looking round building inmidst of the square that used to be a market hall. So say the locals, and so say I. Running across the Rynek, hurrying to meet someone or other, and from the tower of Mariacka, St. Mary’s church with the two unevenly high towers, the melody of the Hejnał is sounding out to my ears, falling right into my heart, and I have to stop and listen to it. „Hejnał“ (which funnily enough is pronounced something like „hey, now“) is derived from a Hungarian word for Dawn. It is a very old Polish signal melody. Legend has it that when the Mongols tried to invade Poland in the middle ages, a guard was keeping watch on the tower and sounded the Hejnał to warn the people of Kraków when the army approached the city. He was shot mid-melody so that he couldn’t finish. Until today, every full hour an interrupted Hejnał is sounded in all four directions from Mariacka’s tower. Yes, even in the middle of the night. No, it is not a record. Listen to it here. Having a kosher* dinner at Klezmer Hois in Kazimierz and accidentally stumbling upon a Klezmer concert in the room next door. I’m standing in the door way, covertly hidden away. In front of a delicate dark red curtain with golden ornaments, there is a man with a double bass, one with an accordion and a young woman with a violin. Their play is sweet and snappy, lively and melancholy. Hava Nagila. Bei mir bist du scheen. The woman will at times put down the violin and start singing. Her voice is deep and velvety, it sounds like the dark wood boarding on the walls. Like the stone pillars and the lace doilies on the tables. From dark depths, the voice is softly climbing up, sighing high, desperate, the way Klezmer clarinettes usually do. I feel like sighing myself. Magical, magical Kraków. *I recently learned that Klezmer Hois is NOT a kosher restaurant. Sorry about that mistake! Diesen Post gibt es auch auf Deutsch. Istanbul and I, that is love for life. On the night bus from Vargas in Bulgaria, I feel a sudden jolt of fear. I must be out of my mind going to one of the largest cities in the world, all by myself, without even so much as a city map in my purse. I have no idea about Istanbul. I haven’t even read Orhan Pamuk! Slightly panicked, I still think that maybe a bit of awe will do me good. I get off the bus in Bayrampaşa and pair up with a young Swedish couple to find the way downtown. In the next few days, we will explore the city together on occasion. There is water everywhere. Everything is blue and gold. Mosques oversee the city from the shores, proudly, powerfully. A Western orientalism is surfacing from inside of me, and I might romanticize the beauty of it all, but I cannot help myself: I’m enchanted. We go to have breakfast in the passageway below Galata bridge – the bridge of the Golden Horn, Haliç. The waiter speaks excellent German. He worked in Radolfzell at Lake Constance for five years. As a welcome gift, each of us gets one of the pretty colorful saucers from him. The Turkish yoghurt is dripping with a thick layer of honey and tastes like a summer vacation. It is windy and fresh on the boat, the sun is beaming, and so are we. Every look to the shore offers a new, ever-different, ever-constant beautiful sight. I see all those things and I don’t know what they are called or what their function is, I cannot tell if they are palaces, government buildings or sacred places. I have no presuppositions toward Istanbul, I am completely naive and unprejudiced – maybe that is why every new outlook comes crashing not only to my eyes and my brain which is struggling hard to comprehend the beauty; no, all the things I see find their way directly into my heart. A feeling of freedom, of liberation comes upon me there on the green and blue waves of the Bosphorus. Europe and Asia, modernity and antiquity, I find myself at the core of a gigantic metropolis of opposites that tries to merge European lifestyle and middle-eastern joy of life into a unique and wonderful entity. Through Gülhane-Park and along the mighty walls of Topkapı palace, we make our way to Ayasofia. The streets are full of life, tourists are recognized as such at once. Street vendors call after us, „hey lady! lady!“, they’re screaming, trying to sell us anything and everything – kebab, orange juice, jewellery, carpets. We can’t bypass the juice, it is squeezed right at the street stand and is so tasty, so fresh and sweet that I don’t ever want to drink juice from a carton again. We meet a sixty year old gold smith who is drinking his Çay next to us. He shares with us the wisdom of his age, the lessons life has taught him. Some I agree with, some I don’t. I’m meeting Emre, my Couchsurfing host, in the evening at Taksim Meydanı. I’m early and give in to my darkest tourist cravings: Venti Iced latte at Starbucks. I haven’t seen a Starbucks on my trip so far anywhere, and God knows I haven’t missed it, but now that I do see one, an Iced Latte seems like heaven, and it is. Chaotic traffic, exclusively young people, an overdimensional Turkish flag, fancy hotels, Dürüm stands. Life in all its richest form at the roundabout around the metro station, fast and energetic, but I cannot find it in myself to feel stressed out by it. Emre and I walk over to his apartment on a cul-de-sac – and suddenly everything goes quiet. Dozens of homeless cats are playing games on the ridiculously steep and narrow street. The life of Taksim is raving just a few blocks away. It feels good being in this place right away. Good and right. Five days later, when I walk from there to my shuttle bus that will take me to Bayrampaşa, I will feel like I have lived here rather than just visited. Fındıklı is the metro station that I get to when I keep walking down toward the water from Emre’s place. At the shore of the Bosphorus I have my breakfast every morning – Starbucks coffee and börek. Bosnia may have the Balkan’s most delicious burek, but Turkey is the mother country of börek. The view over the water – indescribable. A playground where kids are yelling right across from me is putting a smile on my face. I don’t lose that smile for the entirety of my stay in Istanbul. Rosehouse park, as is the English name, at Topkapı Sarayı is an oasis of peace in this gigantic megalopolis. It is green and colorful and inviting. I’m sitting on one of the benches, behind me two guys are playing guitar. I’m moving to the lawn, waiting for them to play something I know. Here it comes: „Wonderwall“. I’m starting to sing along, they invite me over, we play music. They are from Lebanon. It is very easy to meet people here. All of a sudden it starts to rain. I’m seeking shelter underneath a tree. A baby kitten is hiding underneath my long skirt. It’s loud and busy inside the Blue Mosque. Shoes must be taken off, but there is no need for a head scarf in the visitor’s area. Children run and play on the soft carpet. People are sitting cross-leggedly on the floor, tourists are reading out their guide books to each other, the camera clicking won’t stop. Inspite of this, it’s a deeply spiritual place. People are praying inmidst of life here, not in silent reclusion. I find mosques to be so much more inviting than Christian churches. I consider myself a believing Christian (although actually I believe in many things, but that’s for a different post), but churches are so often intimidating in their unsubtle demonstration of religious power and greatness. Mosques just wrap you in a huge hug when you enter them. I think of St. Peter’s Cathedral in Rome, and I associate: big and impressive. I think of the Blue Mosque. I associate: warm and alive. Taksim, oh, Taksim. I have lost my heart Taksim. Life is of higher density in this place than it is elsewhere. Emre and I are having dinner in a simple small restaurant. We pick the fish that they will grill for us ourselves in the window. With that comes a salad, and watermelon for desert. All of it is so intense, food has never tasted like this. A Canadian guy in Bulgaria said to me: “I didn’t know that cucumbers had a taste before I came here! I thought they were just water!” I feel like that with everything I eat in Istanbul. Emre and I are exploring the tiny cobblestone streets with their millions of street cafes and bars. We have a beer in a bar where there is never a song playing that I don’t love. I cannot even decide what I want to look at first, and everything is changing all the time, but it doesn’t go unstable or in any way uncomfortable, it is never disconcerting. Glistening colored lights on house walls. Cigarette smoke and the smell of Dürüm in the air. People meeting, on accident, greeting each other with a warmth that touches me, that touches places in my soul I didn’t know existed. The place is full of energy, infectiously so. Happiness is coming over me in waves. From Beşkitaş we take the ferry to Kadıköy on the Asian side of Istanbul. At Haydarpaşa train station, the place that Muslims traditionally start their Hajj to Mekka, we’re slowly entering the port. We’re drinking Turkish coffee at the shores of Bosphorus and enjoying the chilled out atmosphere. It doesn’t feel very different on this new continent. It does a little though. I can’t describe why. The clouds above Europe are turning grey with a thunderstorm. A sky of such width as I have never seen is stretching from horizon to horizon. That this city can be so massive and that there is still always so much sky to see! Ayasofia, the famous. A place on many Bucket Lists, from what I gather. A historical place. Beautiful. Unintelligible. To me, it makes me sad. Again I think of Rome, this time of the Sistine Chapel. My host mom said about it: „It was like a mall in there.“ Ayasofia is not a spiritual place anymore. It is now only a museum. Only? Maybe that is the one way to protect this incredible site from the claws of history, the ravages of time. 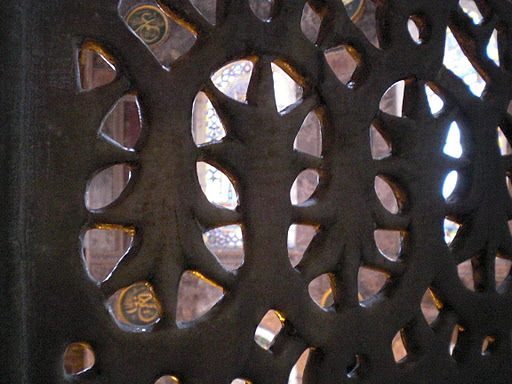 It is difficult for me not to see Ayasofia as a holy place, but as a tourist object. I can’t feel it. It remains to me, inspite of its beauty, soulless. I must have landed in the gardens of Alamut. Again I’m thinking that my Western perspective must be romanticizing the oriental style into fairytale magic. I wonder if a Turkish person sees Topkapı the way that I see the Prussian castles around Berlin, like Sanssouci in Potsdam. And if they do, then what would they find Sanssouci to be like? I lose myself in the different palace buildings and the countless gardens. In one room, a young man is singing from the Quran. I stand still for twenty minutes listening to him, tourists passing me by who don’t stop even for a second to turn their heads. Can’t they feel the power, the magic in this music? „It has to be night,“ Emre says, when at 8 o’clock we are making our way to Ortaköy. We buy Kumpir and sit at the waterfront. Kumpir is a delicious dish that I know from a few small places in Germany in areas with a large Turkish minority. It is essentially a baked potato, but the flesh is mashed with cheese and filled with different veggies and salads – mine has couscous and olives and goat cheese and is beyond delicious. Boğaziçi Köprüsü, the first bridge of the Bosphorus, is lit up in all colors of the rainbow. A dark blue night sky is shimmering through a lose cover of clouds. Ortaköy Camii, the mosque, sits proudly and quietly behind us. Life is buzzing around us like in a beehive. The waters of the Bosphorus are making quiet, laughing littel waves, but they aren’t so unsteady as for the waters to go dull. Instead they are glistening like distorting mirrors. The shining lights are thrown back into the night air. The city offers everything, but it isn’t asking for it. Its greatest gift to its visitors is that in this place, they can just be. Whatever that means to every one of them. Taksim is not losing any of its charms during the day. I buy a ring. I want to wear the city on my finger. 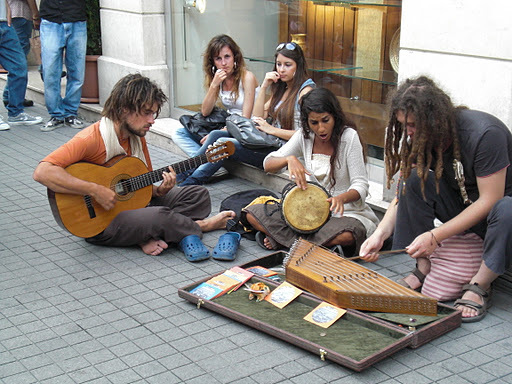 The long precinct, İstiklâl Caddesi, is packed with street musicians. They play music of such different styles and sounds, the atmosphere changes on every meter with the music. Emre and I are smoking Nargile (shisha), eating Dürüm (kebabs), drinking Ayran (salty fluid yoghurt) and playing Tavla (Backgammon). We’re sitting in a back yard with many people who are having Çay or coffee and where old books are sold. We’re just people watching. I haven’t ever found it so easy to find peace in a big city. The shuttle bus from Taksim to Bayrampaşa is going along the entire Southern shore of the Golden Horn. Once more I look over to Beyoğlu. On the horizon above Istanbul, a red moon is rising. I’m leaving this city ever so wistfully. I couldn’t stand it, if I didn’t know it with all my heart that I will come back – one day.